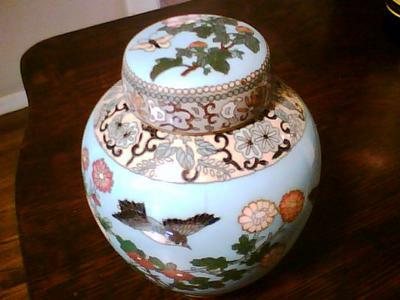 Can you give me any idea of the value of the very old Japanese cloisonne ginger jar? I know that it is at least 70 years old, possibly much older than that. It is in extraordinarily good condition, not a single flaw, chip, or crack can be seen. It even includes the small metal piece that fits into the jar below the lid. Even this metal piece is in near perfect condition. It even appears to have some sort of maker's mark on it. I know this mark itself is at least as old as the ginger jar itself. 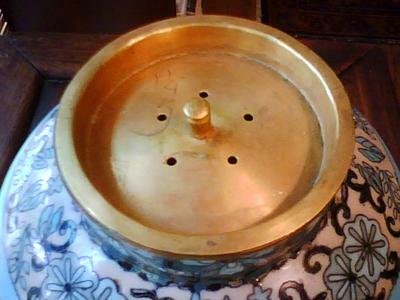 I'm afraid we cannot help with the age of Japanese items, and we don't talk about value here. The latter is subject to many factors. See "Value of Antiques" in the left menu.